A stylish view of life through the eyes of an all-female cast of characters, The Women is a whirlwind tour of what occupies New York's upper class. And for the women of high society, the main topic of obsession in men. Mary Haines (Norma Shearer) is sweet and trusting, the loyal wife of Stephen (none of the men are ever seen or heard) and mother of Little Mary (Virginia Weidler). 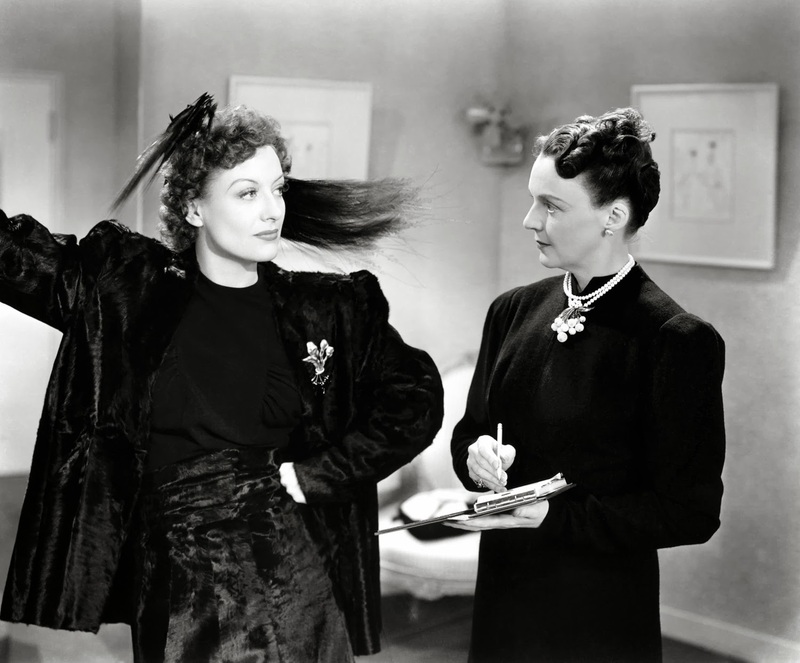 Mary's cousin Sylvia Fowler (Rosalind Russell) visits the beauty salon to get the latest Jungle Red nail colour, and learns from the gossipy manicurist that Stephen is having an affair with department store perfume seller Crystal Allen (Joan Crawford). The news spreads rapidly, and eventually reaches Mary. Initially Mary is respectful of the wishes of her mother (Lucile Watson) to keep her marriage intact, but eventually she confronts Crystal and then Stephen before deciding to get a divorce. Mary travels to Reno, where divorces are quickly handed out to women marching out of their marriages. 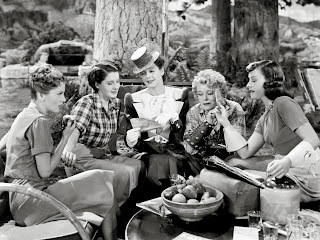 On the train she meets Countess de Lave (Mary Boland), who has divorced numerous husbands, the spirited Miriam (Paulette Goddard), and the delicate Peggy (Joan Fontaine). In Reno they all stay at the ranch house of the outspoken Lucy (Marjorie Main), who readily doles out advice to her guests. As Mary moves into a new phase of her life as a single woman, there is a nasty surprise in store courtesy of Stephen and Crystal, while Sylvia gets a shock of her own, leading to new alliances among the ladies of New York. Directed by George Cukor, working to earn his title as a "women' director", The Women is a talky, often boisterous movie. Based on Clare Boothe Luce's play, this is a story set in the salons, gyms, kitchens, department stores, fashion boutiques and living rooms occupied solely by women. And the ladies talk and talk and talk, sometimes too quickly, often interrupting each other, at other times screaming in delight or anger. Nothing happens in the film other than what is talked about, in person or over the phone, and the stories of failing marriages, sordid affairs, divorces, pregnancies and revenge are all recounted through shared gossip or conversations often delivered at a rapid pace. And ironically for this man-free zone, the lives of the women are almost solely preoccupied by their men. Mary and her friends are obsessed with the thoughts, actions, feelings of their husbands and lovers. Liberated as they are by 1939 standards, the lives of these upper class women are dominated by continuous plans to win, please, defend, support, seduce or punish their men. Other than one gossip columnist, none of the women appear to have any jobs worth mentioning, and the precocious Little Mary requires limited parenting, leaving the women plenty of time to exchange sharp barbs and hatch men-related schemes. At more than 130 minutes in length, The Women is packed with...women. If the film has a weakness, it's in the large number of characters, often introduced in a hurry and proceeding to contribute a ton of verbiage. It's sometimes difficult to keep track of - or care about - all the multitudes of women who have to have their say. And inserted into the middle of the film is a technicolour fashion show sequence that is both jarringly out of place and a welcome respite from the overflowing rivers of estrogen. The performances of the lead actresses are bright, energetic and catchy. Shearer gets the most extended and sympathetic role, and is generally closest to the relative sanity of reality. Russell is larger than life, sassy, funny and ensures that Sylvia is unable to control her urge to gossip, the girl who makes the world go round until it smacks her in the face. Crawford has few scenes, but Shearer's real-life rival vamps up the screen with a claws-out performances full of naked, marriage-wrecking ambition. Goddard and Fontaine also shine in smallish roles. The Women gently takes some humorous pokes at its heroines while celebrating their emotional strength, resourcefulness and determination. These women may need their men, but they certainly also know how to thrive in their man-free havens.